Scanning Probe Recognition Microscopy (SPRM) is a new scanning probe microscopy capability developed with myself as Principal Investigator in an NSF GOALI collaborative partnership with Veeco Instruments. In Scanning Probe Recognition Microscopy, the scanning probe microscope system itself is given the power auto-track specific regions of interest through feature recognition coupled with adaptive scan plan generation and implementation. 'Feature' means any recognizable element, not just topography; for example, I currently investigate nanoscale elasticity as a physical property feature. SPRM is an approach that works directly with the interaction sensing capability of a scanning probe microscope, which inherently has atomic to nanometer scale resolution. The human operator interaction is now focused to the decision-making level rather than the execution level, and the research emphasis evolves from sample imaging to feature/property investigation. 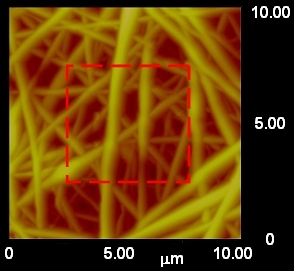 In the images shown below, SPRM is used to auto-track along individual nanofibers within a nanofibrillar matrix of electrospun polyamide nanofibers, enabling property extraction including nanoscale elasticity and surface roughness. 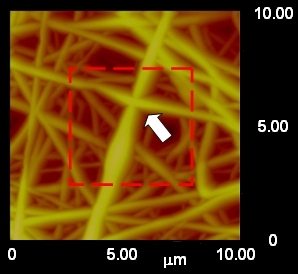 Data from SPRM auto-track investigations over multiple individual nanofibers is compiled into a new, statistical representation of each property for the nanofibrillar matrix as a whole. These particular nanofibrillar matrices are used as tissue scaffolds for regenerative medicine for the central nervous system (brain and spinal cord), which is one of the most challenging injury repair situations. A coarse scan encountered the left hand nanofiber. A high resolution scan was initiated and performed to the end of the scan range. The tip was then returned to where coarse scan mode was interrupted and continued until it encountered the right hand nanofiber. See as SPRM video (.avi). Incorporation of adaptive learning in SPRM enables the high resolution scan along the nanofiber to continue past the cross-over point of two crossed fibers. See as SPRM video (.avi). (PDF) Ayres, VM, Chen, Q, Fan, Y, Flowers, DA, Meiners, S, Ahmed I, Delgado-Rivera R. Scanning probe recognition microscopy investigation of neural cell prosthetic properties. Internat J Nanomanufact, in press 2009. (PDF) Delgado-Rivera, R, Harris, SL, Ahmed, I, Babu, AN, Patel, R, Kamal, J, Ayres, V, Flowers, D, Meiners, S, 2009. Increased FGF-2 secretion and ability to support neurite outgrowth by astrocytes cultured on polyamide nanofibrillar matrices. Matrix Biology 28, 137-147. (PDF) Meiners, S, Ahmed, I, Ponery, AS, Amor, N, Ayres, VM, Fan, Y, Chen, Q, Babu, AN, 2007. Engineering Electrospun Nanofibrillar Surfaces for Spinal Cord Repair: A Discussion, Polymer Internat 56:1340-1348.Invited manuscript for In Focus issue. (PDF) Fan, Y, Chen, Q, Ayres, VM, Baczewski, AD, Udpa, L, Kumar, S, 2007. Scanning Probe Recognition Microscopy Investigation of Tissue Scaffold Properties, Int J Nanomedicine 2:651-661. (PDF) Ayres, V., Udpa, L, 2006. Scanning Tunneling Microscopy, pp 516-523 in Encyclopedia of Medical Devices and Instrumentation (Second Edition). Editor Webster, J, John Wiley and Sons Inc, Hoboken, NJ. Invited review in medical reference encyclopedia. (PDF) Fan, Y, Chen, Q, Kumar, S, Baczewski, AD, Udpa, L, Ayres, VM, Rice, AF, 2007. Scanning Probe Recognition Microscopy Investigation of Nanoscale Mechanical and Surface Roughness Properties Along Nanofibers, pp 1021-HH05-26. In Surface and Interfacial Nanomechanics, Editors Cook, RF, Ducker,W, Szlufarska, I, R.F. Antrim,RF, Mater. Res. Soc. Symp. Proc. Volume 1021E, Warrendale, PA.
(PDF) Chen, Q, Fan, Y, Kumar, S, Baczewski, AD, Udpa, L, Ayres, VM, Rice, AF, Meiners, S, Ahmed, I, 2007. Cell Response and Tissue Scaffold Triggers Investigated by Scanning Probe Recognition Microscopy, pp 1019-FF06-04. In Engineered Nanoscale Materials for the Diagnosis and Treatment of Disease, Editors Hackley, VA, Patri, AK, Stein, J, Moudgil, BM, Mater. Res. Soc. Symp. Proc. Volume 1019E, Warrendale, PA.